Hilights entertainment has over 22 years experience in providing the ultimate in professional DJ entertainment, guaranteeing you the best DJ for your party or event. We work with our customers in advance to ensure your requirements are fully understood and that everything that you want to make your night special and memorable will be provided, meaning we will ensure your event surpasses all expectations. Upon calling Hilights Entertainment you will speak to the DJ that owns the company, giving you the peace of mind that we can fully understand what you want for your event and can provide any advice needed, including times, venues etc. We never use agency DJs, so you can rest assured that the DJ you have for your event is the DJ that fully understands what you require and will never let you down in any way. We have a vast range of music covering all eras from the 40’s right up to the current day, and everything in between. We are happy to take requests both before and during the event. If you want to send us a playlist prior to the event, we will assure that all of your songs are played. Alternatively you can bring a CD along with you on the night for those extra special songs we may not have, which we will return to you at the end of your event. On the night we take the usual requests via guests coming and asking the DJ for songs and also via our unique text feature for those that don’t like coming forward, we will also give you a mention to! All of our music is digitally enhanced using the latest digital technology, and as we use state of the art audio equipment and a top of the range QSC and Denon digital PA system it ensures crystal clear sound quality. Hilights have superb laser, LED and intelligent lighting shows to illuminate your event. Our lighting is adaptable so you can choose to have subtle lighting, a full lighting show or anything in between, it’s your event so your choice as always. Highlights entertainment cover all your disco needs including: Weddings, Anniversaries, Birthdays, Surprise parties, Retirements, Company and Corporate events, Charity nights and basically any occasion you have in mind. As well as the usual disco we can also provide some party entertainment with the adults, similar to what we do with the children. 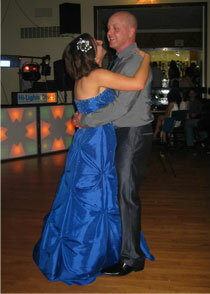 These include fun dances and games, which the adults seem to love! This changes your night and makes it different to the usual. The DJ will interact with the crowd throughout the night. We are happy to accommodate most venues both inside and outdoors. We don’t have set format for our discos as each and every one of them is special to you and needs to be catered for your event and requirements. So if it’s a great night with a top class DJ, great music and lighting with the best entertainment you require, then Hilights Entertainment is the company for you. We are totally reliable and will guarantee you, we will make your night just the way it should be. To ensure the safety and peace of mind of all concerned, we carry a £10,000,000 public liability insurance, all of our equipment is PAT (Portable Appliance Tested) checked and we have current enhanced CRB disclosures. All certificates are available to view upon request. MY WIFE AND I HAVE USED HILIGHTS FOR A FEW PARTIES. EVERY TIME WE HAVE NOT BEEN LET DOWN, AND WITH THE ADDITION OF THE NEW PHOTO BOOTH WE’LL DEFINITELY BE USING THEM AGAIN! HILIGHTS DID THE DISCO FOR MY 18th BIRTHDAY PARTY. JAMES WAS GREAT, HAD ALL OF THE SONGS WE WANTED AND THE ATMOSPHERE WAS BRILLIANT. If you used us for our Disco or any other services, we would love for you to submit a testimonial for us to put on our site!